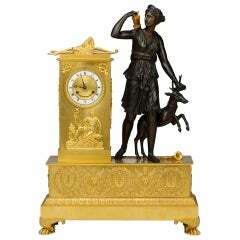 French pendule clock out of gilt bronze, standing on conical feet with sphinx and flower wreaths in relief at the base. 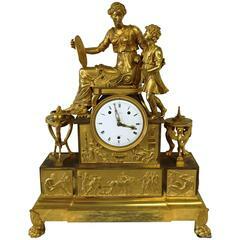 The pedestal supports a fluted column with a sundial on top. The enamel clock face is inscribed “à Paris”. A young woman leans on the column, holding letters in her hands. Französische Empire-Mahagoni-Kaminuhr mit vergoldeter Bronze- und Palmettenverzierung. Hergestellt von Menat in Paris, kompliziertes Zifferblatt, das die Tage der Woche anzeigt.